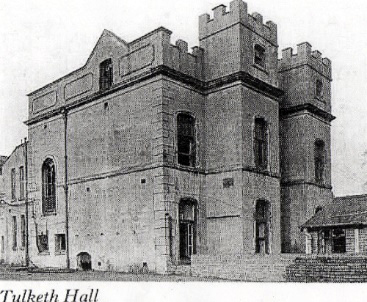 Tulketh Hall stood in Lancashire to the west of Preston until 1959. This is a compilation of information about Tulketh Hall and the whole area referred to as Tulketh. Tulketh is in much the same place it has always been, but the surroundings have certainly changed! Here is Tulketh Hall on Yates map of Lancashire from 1786. The small stream separating Preston from Tulketh is clearly visible, as is the marsh into which it flowed (called Preston Marsh4). Tulketh Hall had an uninterrupted view of the river, and being on the outside of a bend the view would have stretched quite a long way in both directions, making it a strategically important position. 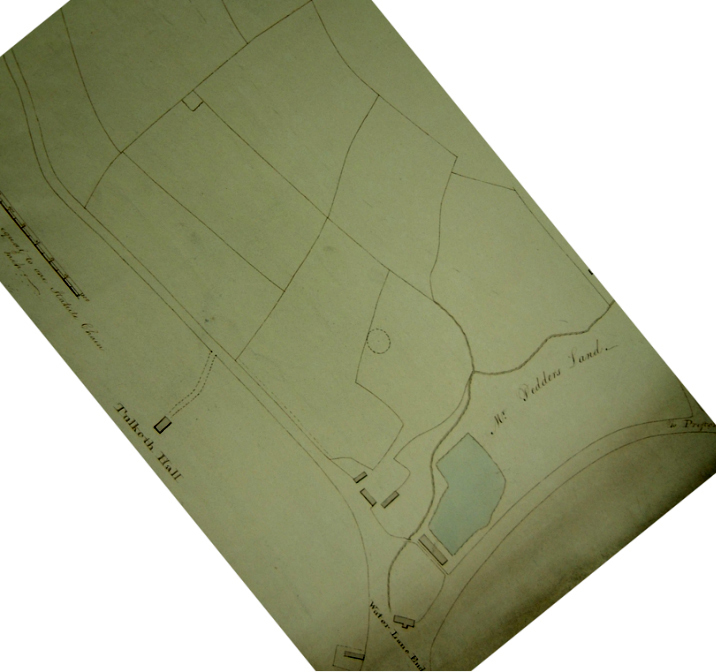 A drawing was made during planning for the construction of the Lancaster Canal in the 1790s 5, but unfortunately it has no named roads and no indication of which way is north. To work out which way round this map is and to see how much the landscape around Tulketh has changed I’ve matched this map to the 1906 Ordnance Survey map. The two maps can’t be overlaid precisely because the earlier map was only surveyed approximately. Figure 2: 1790s (top) and 1906 (bottom) maps of the Tulketh area. Some features on the 1906 map that can also be found on the earlier map are highlighted in blue. Here Tulketh Hall is shown on Lewis’s map of c.1840. On this map Tulketh is clearly still outside Preston, though Preston engulfed it a few years later. The railway and canal have cut across the landscape. 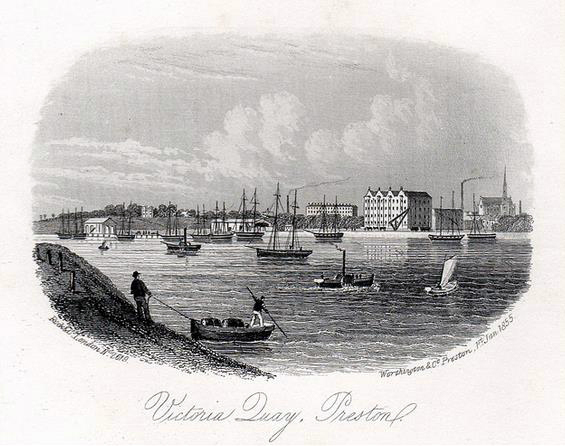 Victoria Quay was built south east of Tulketh Hall in the 1840s and had its own railway branch line, built in 1846. 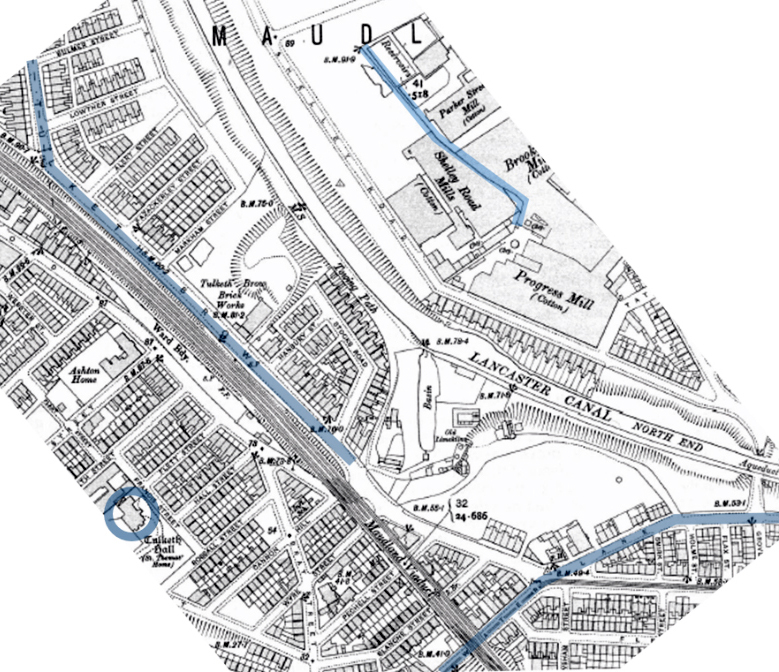 In the 1880s the Ribble was diverted to a course much further south as part of the building of the docks that survive today 6 as shown on this map (I have marked the position of Tulketh Hall on the map with a star). The railway branch line that served Victoria Quay was extended to serve the new docks, and survives as the Ribble Steam Railway). Figure 4. 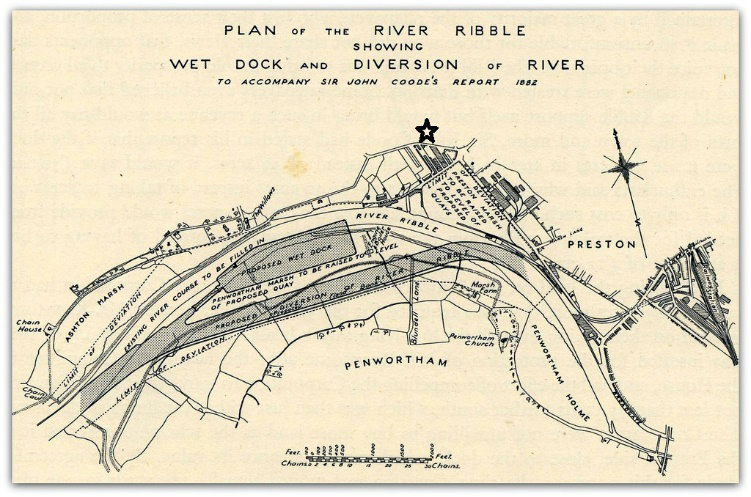 Plan of the new docks and river diversion of the 1880s, with Tulketh Hall marked by a star. Figure 5: Tulketh Hall on the 1906 OS map. 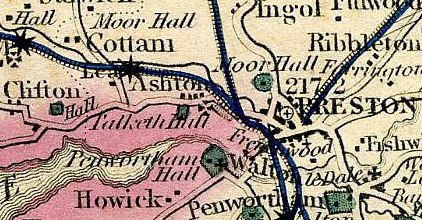 This close-up from the 1906 Ordnance Survey map shows the location of Tulketh Hall clearly amongst roads that still exist today. Figure 6: The site of Tulketh Hall today. To bring the story up to date, here is an overhead view of the site taken in 2015. This view can be easily compared to the 1906 OS map. It is notable that most of the site is grass or car-park. 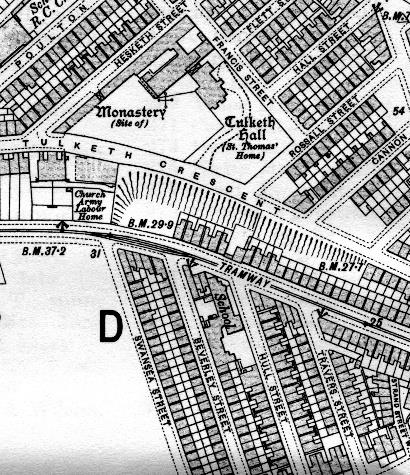 Other than the demolition of Tulketh Hall itself, all the other buildings on the plot shown on the 1906 map are still there, whilst the only additions are insubstantial. What did Tulketh Hall look like? This is the earliest known view of Tulketh Hall, though it shows little detail. 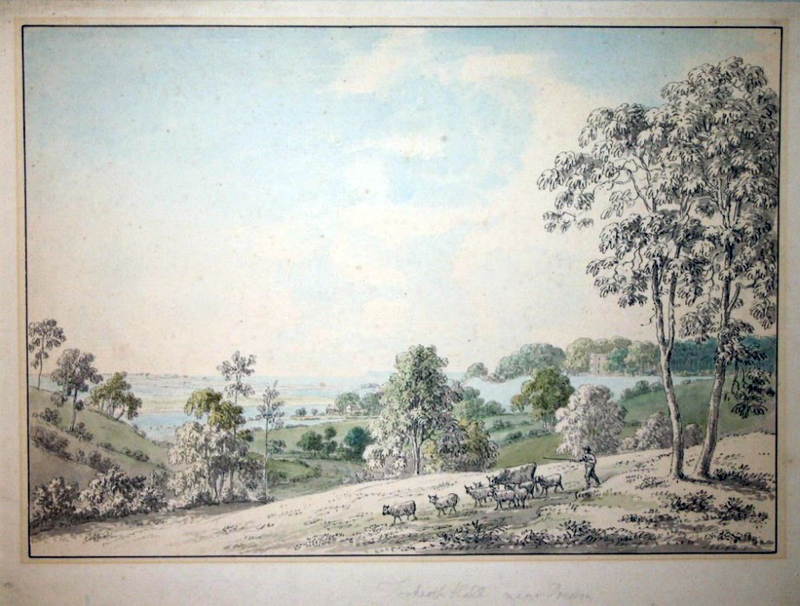 Figure 7: Buck’s 1728 view of Preston from the South, showing ‘Tulcheth’ marked by the number 2 towards the left. This ink drawing with watercolour by Anthony Devis was probably created in the 1760s or 1790s. 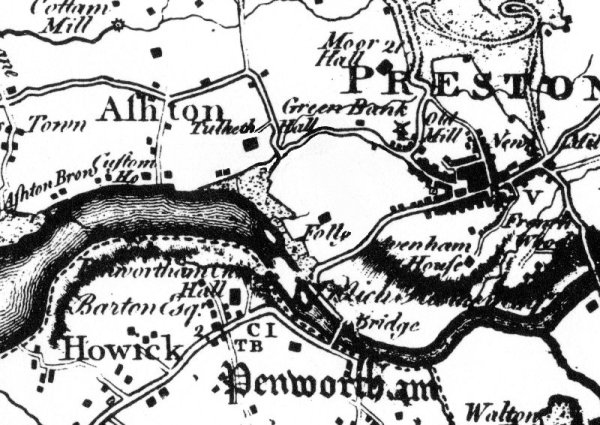 It was drawn from just outside the western limit of the built-up area of Preston, and clearly shows the countryside gap before you reach Tulketh. Figure 8: ‘Tookerth Hall, near Preston’ by Anthony Devis (1729-1816), in the Harris Museum and Art Gallery, Preston. The hall is near the horizon towards the right. 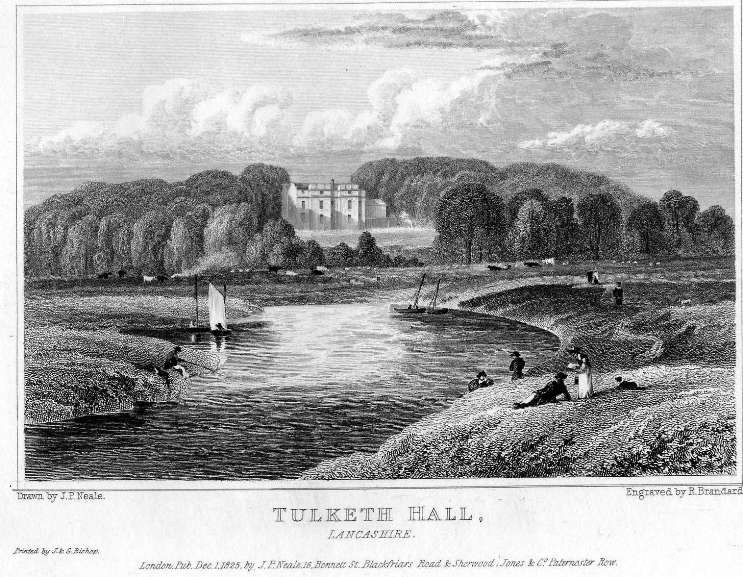 The earliest view showing much detail of Tulketh Hall is an engraving of 1825, shown below. Figure 9: JP Neale’s engraving of 1825. The artist here is facing north-west. Two parts of Tulketh Hall jut out forwards, and a single storey part sticks out to the right, which perfectly matches the outline of Tulketh Hall shown on the 1906 OS map (Figure 5). Trees surround the Hall, but a clear view to the river and marsh has been maintained. 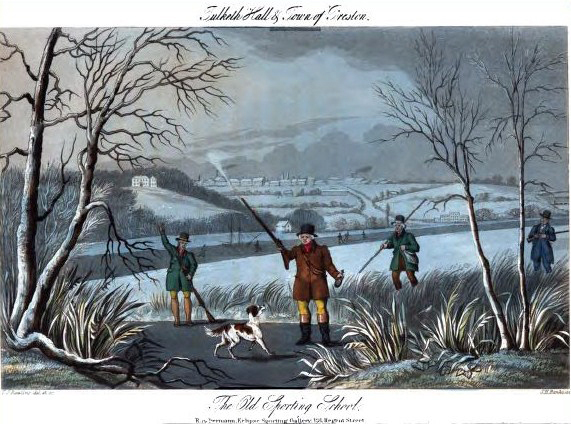 A more distant view from Penwortham is shown in this print from an 1837 book about how to rear and encourage game birds for shooting. 7 It too shows the clear view down the hill to the river. 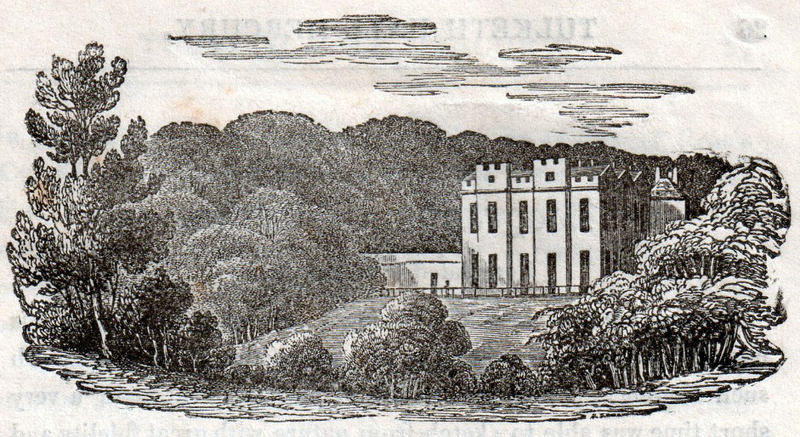 Figure 10: Tulketh Hall (on the hill on the left) as seen from Penwortham in a book published in 1837. 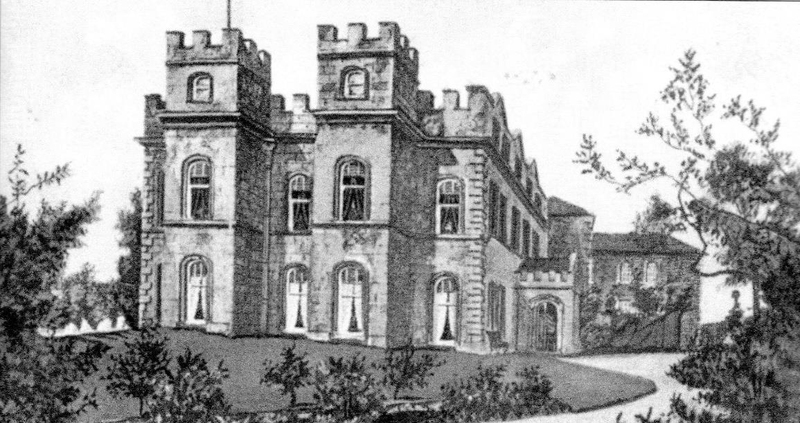 A closer view of the Hall is shown in this header from the ‘Tulketh Hall Mercury’ (see later section) in the 1840s. The main entrance faced to the right as we see it here, facing north-east up the drive which leads to the road (now Tulketh Brow) as shown on Figures 1 & 2. In 1860 the architect Joseph Aloysius Hansom ‘restored’ Tulketh Hall and he himself later admitted that he had ‘thoroughly succeeded in defacing its ancient characteristics’. 4, 9 He also removed an avenue of trees that lined the approach to the Hall – an act he was to regret some years later. 4 Hansom designed Birmingham Town Hall, and many churches, mainly Catholic ones (he himself was Catholic), but is better known as the inventor of the Hansom cab, the horse-powered predecessor of the modern black taxi cab. Around the same period as Hansom’s work on the hall, the surrounding land was built on. 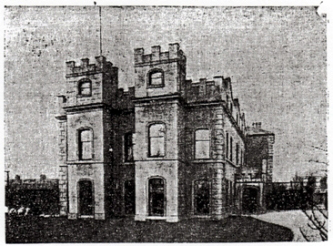 Figure 13: Undated photograph of Tulketh Hall 4, which must have been taken before 1906. The painting below shows the sweeping drive following the route seen on the OS map (Figure 5), going down to the new road, Tulketh Crescent. The large building on the painting shown behind Tulketh Hall and to the right as we look, also shown on the 1906 OS Map, is not present in the earlier photograph. Occupying a strategic position overlooking the river and estuary of the Ribble, Tulketh has long been a focus for human activity. It has in the past been suggested that Tulketh was Roman in origin, perhaps the sight of a stronghold, or castle or even a granary. However, no Roman remains have been found at or near Tulketh, and it was not the river crossing point in the Roman period, though it could still have been a lookout point. 12 Apparently, Mr West reported a mound and ditch south-west of Tulketh Hall in 1774 12, on a high promontory, which was levelled in 1855/6. Another source places the earthworks about 300′ south-west of the Hall, saying that there was a circular, conical mount, 125′ in diameter, and a semicircular ditch. 13 There was evidence of a building just outside the ditch 12, parts of which were still visible in the 18th century. 14 This building is supposed to have been a monastery (also indicated on Figure 5) of which more later. In the late 19th century, below the site where the monastery is said to have stood, a sealed-up well was discovered, 60 feet deep, and nearby were the remains of a stone culvert. 15 It seems certain that settlement at Tulketh must have started at latest in the Norman period, and possibly earlier. I’m not aware of any modern archaeology having been conducted on the site. Now would seem like a good opportunity for this, whilst the site is mostly free of buildings – it can only be a matter of time before it is built on again. The one to spousalls, the other vowed cloisters. The first inhabitants of Tulketh (the area of Tulketh, not the Hall) for whom there is reliable evidence are the monks who established a monastery there in 1124. Stephen of Blois, nephew of King Henry I, and later to be King himself, gave land at Tulketh to found a monastery. 17 Thirteen monks from the Abbey of Savigny in Normandy arrived on 4 July 1124 led by Ewen d’Avranches. 17, 18 On 7 July 1127 the monks transferred their monastery to what became Furness Abbey, and Tulketh was transferred back into Stephen’s ownership. 18, 19, 20 The Monastery at Tulketh was Benedictine, though about 20 years later Furness and Savigny became Cistercian. 17, 19 The historian Baines confused the site of the monastery at Tulketh with the site of the leper hospital of St Mary Magdalene, even saying that the monastery at Tulketh was on the site of a pre-existing hospital. 14 This mistake continues to be copied to this day. In fact, the hospital was in Maudlands (a corruption of Magdalene’s) in central Preston and there is no mention of it before 1178-86. 13, 12, 21 Others claim that the monks adopted the home of Marmaduke Tulketh as their monastery 14, 22 though there is no evidence to support this. In the mid 12th century there was a civil war between the factions of Stephen of Blois, by now King Stephen, and his cousin the Empress Matilda. King David of Scotland took advantage of the anarchy, and from the 1130s to 1149 held all Lancashire north of the Ribble. Perhaps you saw the fictional TV series Cadfael, set in Shrewsbury Abbey at this time? Well, in 1140-2 King David issued a charter to the monks of Shrewsbury Abbey when he was at ‘the new castle of Thulchet’ (Tulketh). 23 This is the earliest reference I’ve found to a castle at Tulketh. There was clearly some kind of structure at Tulketh when the monks of Savigny arrived, but no source I’ve found mentions a castle. Sources speculate that perhaps Stephen built the castle and David repaired or rebuilt it, or else David himself had it built. 24, 25, 23 The castle may have been wooden, but stone keeps were built at Carlisle and Lancaster in this same period 24 and it seems likely that the one at Tulketh was at least partly stone-built. In this murky period some of the land went to the Lea family and some to the Haydock family, and some more was granted to Cockersand Abbey. 26,15 Alice, daughter of William the son of Arthur of Ashton, owned land at Tulketh and Tulketh Carr, and Great Tulketh is mentioned in a deed of William son of Richard of the Cross. 30 Some of the land passed to the Kibald family, and in the mid-13th century Margery, Margaret and Helen, daughters of William Kibald, granted land in Tulketh to the Hospital of St Mary Magdalene, Preston. 31 Adam de Tulketh was a witness to some of these charters. In one of these Helen, daughter of William Kibald, and Roger the Spicer, granted land in Tulketh to the hospital of St Mary Magdalene, Preston. 31 In 1292, William, son of Roger, leased to William son of Paulinus de Preston, his lands called ‘Tulket in the vil of Aston’. 15 At this time there are also references to Margery, wife of Richard de Tulketh, Margery being a granddaughter of William son of Henry de Kellamergh (in 1292 32), and also to Roger, son of Walter de Tulketh (in 1293 33). The Travers family remained Catholics after the Reformation 40 and gradually lost their lands as a result of persecution by the Protestant authorities. Suffering fines, imprisonment and other indignities, they tried to emphasise the worthy, loyal and ancient character of the family. This included, in my opinion, inventing the verses at the start of this section. In 1577 Thomas Preston let out the ‘capital messuage’ called Tulketh in Ashton, which was previously held by Richard Travers, deceased. In September 1607 the Jesuit Reverend J Bannister celebrated mass in a small chapel attached to ‘Tulket-hall’. 15,41 Although the Travers family still owned much of Ashton, by this time their main residence seems to have been Nateby, in Garstang parish well to the north. Fines for their adherence to Catholicism accumulated, and in 1625 William Travers, Richard Travers and William Werden sold the manor of Ashton, with lands in Ashton, Ingol, Clayton, and Leyland, and a free fishery in the Ribble, to Hugh Rigby 26, who was still there in 1633. 42 But Tulketh was still in Catholic hands. In 1687, Bishop Leyburne toured the north of England and confirmed about 20000 Catholics. 42 As a part of this tour, he confirmed many people on 7 September in a small chapel attached to the Hesketh family house at Tulketh. 9, 10, 15, 44 The Heskeths, Walmsleys and Wordens are associated with Tulketh in this period. In March 1710/11, Stanley Worden of Tulketh, gentleman, is referred to in a lease, as is Helena his mother, widow of James Worden late of Tulketh, clerk.45 Stanley Worden/Werden of Tulketh was named in 1722, 1727, 1742 46 & 1746/7 47. By 1733 Roger Hesketh had apparently renounced the Roman Catholic faith, and was described as being of North Meols and Tulketh. 4 Roger Hesketh remodelled Tulketh Hall, and a water downspout dated 1759 carrying his initials is apparently in the Harris Museum in Preston. 4 Perhaps the costs of this building work are detailed in his surviving 1756-89 account book.48 Tulketh Hall is prominently marked on a map of 1786, with ‘Sir Roger Hesketh Esq’ marked by it. Tulketh Hall may have been empty at the time of the 1841 census in May, shortly after Lady Hesketh’s death, as I cannot find it in the census. Mr Hesketh was financially crippled by building Fleetwood and its railway line 57, so in 1845 he sold Tulketh Hall Estates, i.e. the land surrounding the Hall but not the Hall itself, as building land, see the clipping below. Figure 15: Notice in the Manchester Guardian 30 April 1845, evidently copied from the Preston Chronicle. Times had changed. The Lancaster Canal opened as early as the 1790s, the railway in 1840 and the growing industrial and port town of Preston was enveloping Tulketh. 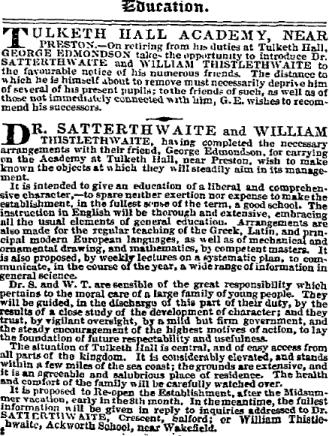 By the time of this sale the house itself was already in a new role as a private school, see for example the newspaper advert below. Figure 16: Advert from the Manchester Guardian 8 April 1843. Figure 17: Advert from the Manchester Guardian, 5 May 1847. Figure 18: Advert from the Manchester Guardian, 9 June 1847. In the 1851 census, William Thistlethwaite and his wife Hannah are at Tulketh Hall, with an assistant housekeeper, five domestic servants and 37 male scholars aged 11-16. In nearby Tulketh Cottage were Michael Satterthwaite and family. Another teacher at the school, George Bennet, was in Tulketh Lodge. During Dr Satterthwaite and William Thistlethwaite’s tenure the woods surrounding Tulketh Hall were felled, spoiling the neighbourhood 59, and they decided to move when the lease expired. 60 Their new premises at Lindow Grove, Alderley Edge, Cheshire, opened in 1853. Tulketh Hall itself was sold by Roger Hesketh to Joseph Bray, a Preston solicitor, in about 1848 4 – this may have been in 1850, as the Harris Library has a sale catalogue for Tulketh Hall from this year (which I’ve not seen). In the 1861 census Joseph Bray, wife Eliza and son Herbert Joseph are living in Tulketh Hall, with a nurse maid, cook, house maid and parlour maid. Mr Bray sold it to Rev Thomas Johnson, who used it as a vicarage for St Mark’s Church. 4 Joseph Hansom improved/decimated Tulketh Hall in 1860 (see earlier), and the surrounding estate of houses must have been built around this period. In the 1871 census, Thomas Johnson, wife Jane and five children are living in Tulketh Hall with four servants. In the 1881 census Joseph Eccles, a cotton mill owner, his wife Elizabeth, four sons and two servants are living there. Apparently Tulketh Hall was sold to George Thompson in 1876 15, but it is not until the 1891 census that we find him there, a man described as living on his own means, with wife Ellen, seven daughters and two servants. Although the censuses do not record the family, according to his birth certificate a Charles Dawson was born at Tulketh Hall on 11 July 1864. 61 Charles Dawson (1864-1916) is known to history as the likely perpetrator of the Piltdown Man hoax, when he found in Sussex a fossil claimed to be the ‘missing link’ between apes and man. He was the son of Hugh Dawson, a Preston cotton spinner, who soon after moved the family to London and then Sussex. The Brothers of Charity, a Catholic foundation, bought Tulketh Hall in 1898 creating the St Thomas’s Home Industrial School for Roman Catholic Boys, and Auxiliary Home (a kind of half-way house between life in the school and in the general community). 62,63 In the April 1901 census, the place is described as a Home for Catholic Working Boys, in the care of Superior Thomas W Bolton, Assistant Superior Francis de Clark, and four Brothers, and against their names is the following ‘Members of the Congregation of the Brothers of Charity who are employed in different works of Charity and whose employment is changeable at the will of the Superior of the Order’. In their care at the time of the census were 31 boys and men aged 9 to 53 (all but six were under 20), many with jobs, and others described as ‘patients in home for infirm and afflicted boys’. The month after the census was taken the Industrial School and Auxiliary Home were certified for 65 and 30 boys respectively, and in October 1903 the Industrial School capacity was increased to 150 boys. 63 On the 1906 OS map, Tulketh Hall is marked ‘St Thomas’s Home’, though the Auxiliary Home was in Tulketh Hall itself, and the Industrial School was in the buildings to the west. St Thomas’s Home: Certified Industrial School and Working Boys’ Home. 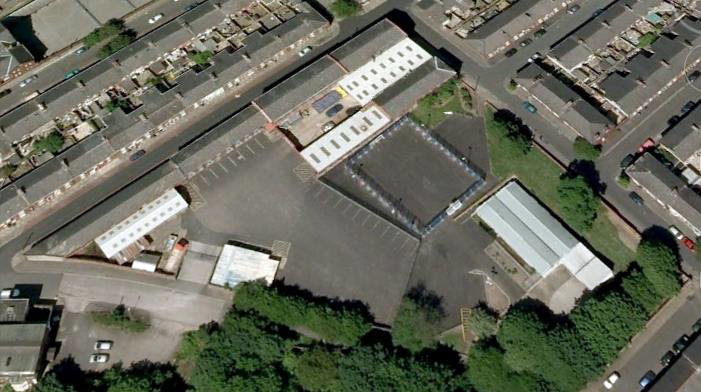 These fine buildings cover nearly three acres of ground on Cannon Hill, Ashton. The historic and ancient Tulketh Hall is now a beautiful and cosy home for poor and friendless working boys, who are carefully tended by the good brothers in charge. The Hall was purchased May 15th 1898 for the sum of £2800. [I’ve here deleted two inaccurate sentences about the ancient history of the site.] The home has accommodation for 30 boys. 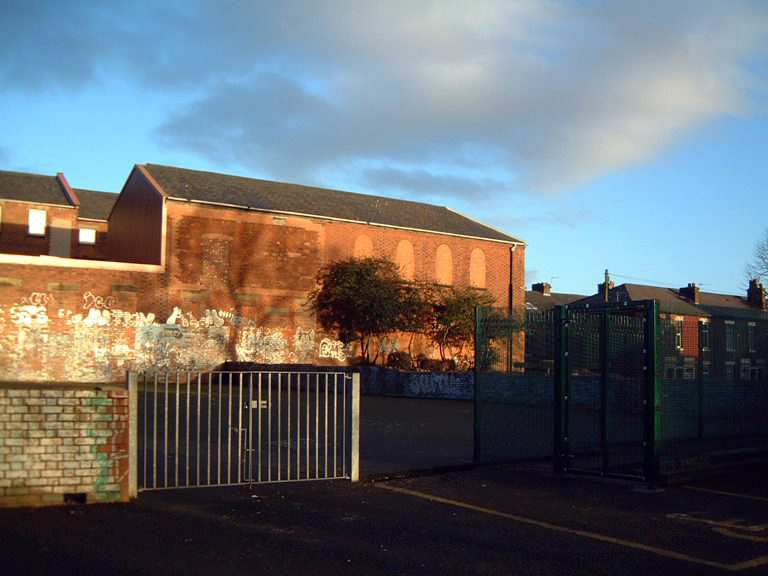 The Industrial School stands in the grounds of Tulketh Hall, and is certified for 150 boys. The original buildings cost £3000, and have been extended at a further cost of £4000, making with other alterations a total of £8000. The buildings were designed by the late Mr W E Withnall, architect, of this town, and built by Mr James Swarbrick, contractor, of Ashton-on-Ribble. The buildings are model in every way: replete with the most modern and scientific appliances in every department. The sanitation is perfect, the air pure and bracing and it possesses the advantage of a very spacious and well-fitted gymnasium. The medical attendant is Dr K Duncan; the honourary dental surgeon, Mr H H Edmondson; and the honourary ophthalmic and aural surgeon, Dr W R Richardson. Both the institutions are under the care of the Brothers of Charity, forming one of the units of their 42 houses scattered all over the world, and testifying by their rapid and constant increase the excellence and utility of the management of this charitable order. The superintendent is the Brother Patrick. There is also a visiting committee of business men, who regularly inspect the Homes. Figure 19: Photograph of Tulketh Hall which seems to show WW2 army barracks on the right. The photo below is taken looking to the north-west over a compound on which Tulketh Hall stood. The largest building in view is the one shown on the 1906 OS map as attached to the back of Tulketh Hall – the large patch of brickwork that covers the hole left when the adjoining Tulketh Hall was demolished can be clearly seen. Figure 20: View northwest over the site of Tulketh Hall, showing part of the Industrial School buildings that survive (2006). I’d like to thank Simon Green, the editor of www.ashtonribble.com for pointing me to sources for the 20th-century history of Tulketh, and providing me with scans of newspaper articles from the Lancashire Evening Post. I’d also like to thank the Harris Museum and Art Gallery, Preston for Figure 8, also Peter Smith, Ian Travis, Pat Kadwell and other helpful people who have contributed information. 1 ‘A handbook of Lancashire place names’ J Sephton, 1913. 2 ‘Proud Preston’s story’ A J Berry, 1928. 3 ‘The origins of Lancashire’, D Kenyon, p68. 4 ‘Tulketh Hall, Preston’, anon, 1939, rediscovered and summarised by R Severs in 1989. A different summary of the same material was on the internet in 2006 but is no longer online. 5 Lancaster Canal Navigation Company map in the UK National Archives piece number RAIL 844/58/17. 6 ‘The Victoria History of the County of Lancaster’, ed Farrer & Brownbill, 8 volumes, 1906-14, v7. 9 ‘History of Preston’ A Hewitson, 1883. 10 ‘A list of convicted recusants in the reign of King Charles II with notes on Lancashire ones by JP Gillow’, Catholic Record Society vol6 ‘Miscellanea V’, p170-171. 11 ‘Images of England. Around Preston, the second edition’, J Garlington (2000). 12 ‘On the Roman remains recently discovered at Walton-le-Dale, nr Preston’, C Hardwick, in Transactions of the Historical Society of Lancashire and Cheshire v8, 1856, p134. 13 ‘The Victoria History of the County of Lancaster’, ed Farrer & Brownbill, 8 volumes, 1906-14, v2 p536. 14 ‘History of the county palatine and duchy of Lancaster’ E Baines, ed Harland, 1868, 2vols, v2, p473. 15 ‘The history of the Parish of Preston in Amounderness in the County of Lancaster’, H Fishwick, 1900, p266. 16 ‘A topographical, statistical and historical account of the borough of Preston’ by Marmaduke Tulket, pseudonym of Peter Whittle, 1821. 17 ‘Medieval Manchester and the Beginnings of Lancashire. Historical Series No.1.’ James Tait, pub. Sherratt & Hughes for Manchester University Press, 1904 (reprint Llanerch Publishers, 1991), p163. 18 ‘Annales Furnesienses – history and antiquities of the Abbey of Furness’, TA Beck, 1844, p109-111. 19 ‘A history of Preston in Amounderness’, H W Clemesha, 1912. 20 ‘Lancashire Pipe Rolls and Early Charters’, W Farrer, 1902, p302-3. 21 ‘Lancashire Pipe Rolls and Early Charters’, W Farrer, 1902, p334. 22 ‘Notitia Cestriensis: historical notes of the Diocese of Chester vol2 part3’, F Gastrell, Chetham Society, Old Series vol22, 1850, p464. 23 ‘The cartulary of Shrewsbury Abbey’ ed. U Rees (1975), 2 vols, p80-1. 24 ‘The Charters of David I’, ed GWS Barrow, (1999), note #112. 25 ‘David I: the King who made Scotland’, R Oram, (2004), p179. 26 ‘The Victoria History of the County of Lancaster’, ed Farrer & Brownbill, 8 volumes, 1906-14, v7, p129-134. 27 ‘Lancashire Pipe Rolls and Early Charters’, W Farrer, 1902, p325. 28 ‘Lancashire Pipe Rolls and Early Charters’, W Farrer, 1902, p123. 29 ‘Lancashire inquests, extents and feudal aids 1205-1307, part 1’ Lancashire and Cheshire Record Society vol48, 1903, p50. 30 ‘The Royal Forest of Lancaster’, R C Shaw, 1956, p331. 31 ‘Descriptive list and index of Cartae Miscellaneae of the Duchy of Lancaster’, in Annual Report of the Deputy Keeper of Public Records Supplementary Series v5(3) 1964, #66. 32 ‘The Victoria History of the County of Lancaster’, ed Farrer & Brownbill, 8 volumes, 1906-14, v7, p160. 33 ‘Lancashire inquests, extents and feudal aids 1205-1307, part 1’ Lancashire and Cheshire Record Society vol48, 1903, p277. 34 ‘Final concords of the county of Lancaster from the original chirographs or feet of fines in the Public Record Office 1196-1377’ Lancashire and Cheshire Record Society, vol39 1899 & vols46 1903. 35 ‘Lancashire Assize Rolls in the Public Record Office, 1202/3-1285, parts 1 & 2’ Lancashire and Cheshire Record Society, vols47&49, c1904. 36 ‘Lancashire inquests, extents and feudal aids 1205-1307, part 2’ Lancashire and Cheshire Record Society vol54, 1907, p108. 37 ‘A calendar of the deeds and papers in the possession of Sir James de Hoghton, Bart., of Hoghton Tower, Lancashire’, Lancashire and Cheshire Record Society, vol88, 1936, pp86-89. 38 ‘A collection of pedigrees of the family of Travers’ By S Smith Travers, arranged by Henry J Sides, Oxford, 1864. 39 ‘Ducatus Lancastriae’ volume 2, part 3 (1827): Calendar of Pleadings, Depositions, Surveys etc., p78. 40 ‘Bill and Ted’s excellent adventure? Or, the fate of the Travers family of Nateby and Tulketh.’ K Z Travis, 2004, available from me. 41 ‘A history of the borough of Preston, volume 2’, P Whittle, 1837, p261. 42 Online catalogue of the Lancashire Record Office, item reference numbers DDKE/Box 91/12-13. 43 ‘Keepers of the old faith – finding the records’ M Gandy in ‘Ancestors’ (magazine) issue 39. 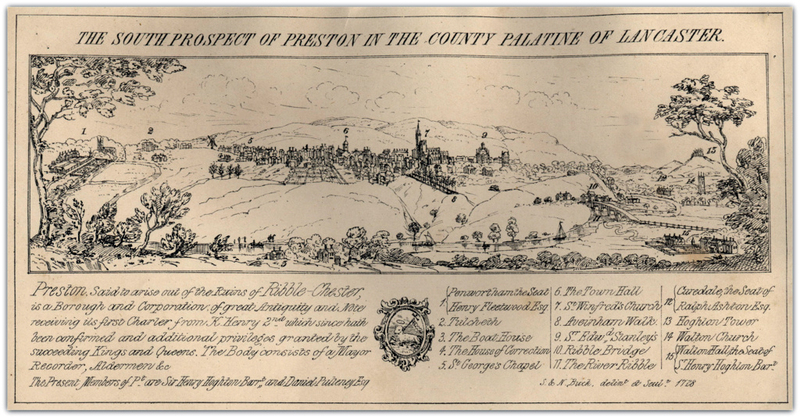 44 ‘A history of the borough of Preston, volume 2’, P Whittle, 1837, p368. 45 M Tyson (1933) ‘Hand-list of charters, deeds and similar documents of the John Rylands Library v1’, Bulletin of the John Rylands Library v17, p150, #292. Can also be found bound as a book made up of the four parts published in this journal. 46 Online catalogue of the Lancashire Record Office, item reference numbers CNP/2/1/13, CNP/6/4 and CNP/2/1/14. 47 Preston St John’s parish church, burial records. 48 Online catalogue of the Lancashire Record Office, item reference number DDPR/138/4. 49 Online catalogue of the Lancashire Record Office, item reference numbers DDR/1/4, QSQ/3/3/101, QSQ/3/3/115, DDHE/81/1, DDTY/10/1/4, QSQ/3/5/44 and DDR/11/1. 54 ‘A history of the borough of Preston, volume 2’, P Whittle, 1837, p368. 58 ‘Physicists of Ireland: passion and precision’, M McCartney and A Whitaker, 2003. 59 ‘A History of Penketh School, 1834-1907’, J S Hodgson, 1907. 60 ‘The Annual Monitor for 1871, or the obituary of the Members of the Society of Friends in Great Britain and Ireland for the year 1870’, see obituary of William Thistlethwaite. 61 John Farrant, personal communication in 2010. 62 ‘General and Commercial Directory of Preston, Longton, Kirkham, Penwortham…’, 12th Edition, P Barrett & Co, 1917. 63 Mary B Wall’s website www.missing-ancestors.com see St Thomas’s Home Industrial School entry. 64 Articles in the Lancashire Evening Post 5/12/1952 (fire), 2/3/1959 (imminent demolition) and 20/5/1959 (demolition underway), provided by Simon Green. Thank you and wonderful job! I have just started researching my Travis family and this is just fascinating! Hi i am researching my ancestors.. My great Uncle Michael Kenny was a boy at the school – St Thomas’ Industrial School. He died there is 1910 – one of the six boys who died of the mysterious illness. I have paper cuttings of the autopsy at Preston Police station and a death certificate. I have contacted the brothers of charity who have been helpful but do not have any records of that time. I have managed to get two pictures of the boys bands at the school from searching the net but if anyone else has any records or pictures up to 1910 I would love to see them. I am trying to find when Michael went there and where he is buried so any thoughts gratefully accepted. I am happy to share what i have.